I have created a new Blog and will no longer be writing in this one. The new one is called, Kickin’ It With Rae and can be found here: Kickin’ It With Rae There is some new content, and I have cleaned up some of the old posts. I will continue to add more content and more areas as time goes on. It would appear that whatever followers I have on this blog, do not just automatically become followers of the new Blog. I apologize for the invon I do hope however, that you have not tired of my writings and will follow me on Kickin’ It With Rae. While watching a show on the Travel Channel about San Diego several years ago, a segment covered many different sites to see in the City. One that caught my interest was what was going on in the Barrio Logan Neighborhood. Murals. Murals everywhere under a bridge. The next shot showed some iconic Low Riders and that was the end of that segment. Intrigued I did a search on ‘murals in San Diego’ and found a website that was dedicated to this project. I knew that on my next visit to San Diego, I had to check this place out, it looked fascinating. I am so glad that I did because it is a remarkable place. As you might suspect, going about daily activities in a city built on water, a 1500 kilometer network of canals, that encompasses 117 islands with over 400 bridges can be difficult to say the least. The challenges it presents are many and very unique. I visited Venice for the first time in 2015, and while I realized that things were difficult, I had no idea what that really meant. I would imagine most of us don’t. After all, we are there on vacation. To enjoy the beauty of this amazing city unlike any other in the World. We don’t think about the ‘how’ of things. At least I didn’t. After much consideration, and a little soul searching, I came to the decision to put off my trip to Italy this year. I feel that it is the best course of action for me at this time. It wasn’t an easy decision by any means. And yet? I felt OK with my decision. Too OK in fact. This really bothered me. It gnawed at me continually. I actually felt guilty. I actually felt as though I were betraying this country that has had such a profound impact on me. I felt as though something had changed. I felt as though I had somehow changed. As 2015 comes to an end, I find myself reflecting, as many of us are, on this journey that we call ‘Life’. I am thankful that I have a job and a steady paycheck unlike so many in our nation today. I pray that this changes for real, and not just on paper with bias statistics to further the political agenda of those in power. I have but 2 days left in Venezia. It has gone by much too quickly. I can feel that she is beckoning me, ‘Stay. Don’t go Rae.’ I know that she has much more to show me. But alas, reality comes slamming back into view and I have to return to work. If I don’t return to work, how will I afford to visit next year? It is that thought, knowing I will return, that will get me through these next 48 hours. Come, come with my on the final leg of my journey through Venezia. A few days ago I ran into someone that I had not seen since returning from Italy. I was asked if I felt safe while I was there. Yes, I replied and didn’t give it much thought at the time. The following day, the day after the mass shooting in San Bernardino, CA amidst all of the vocal activity on Facebook at the outrage, the arguments for more gun control; it being just days after the horrendous attacks in Paris; a post by Rick Steve’s and Bloggers asking people to not cancel vacation plans outside the US; in response to a post that I’d seen on my FB feed, I made mention of the fact that I am much more “afraid” here in the US. I started to think about the question I’d been asked. Did I feel safe while travelling in Italy? My answer is still a resounding YES!! ABSOLUTELY!!! I am not going to discuss the gun issue here or the politics of it, that’s not what this post is about. It is about my feeling safe about travel. And let me stress that these are my feelings and mine alone. It’s a beautiful, sunny day as I throw open all of the windows in my room, open my arms wide and exclaim, ‘Buongiorno Venezia!’ ala Katherine Hepburn. As I gaze down the canal what do I see? What is this? Oh no………. a behemoth of a cruise ship slowly passes by in the distance, towering over the buildings, obstructing any further view and shattering the serenity of the moment. Damn! A few minutes later, another makes its way through the Giudecca Canal across my field of view . Double damn! I have been reading about the outcry of residents on this subject. There has been much written about these giants and what they are doing to the city of Venice, aesthetically as well as the damage they cause to the environment, and the fragile, historical structures. 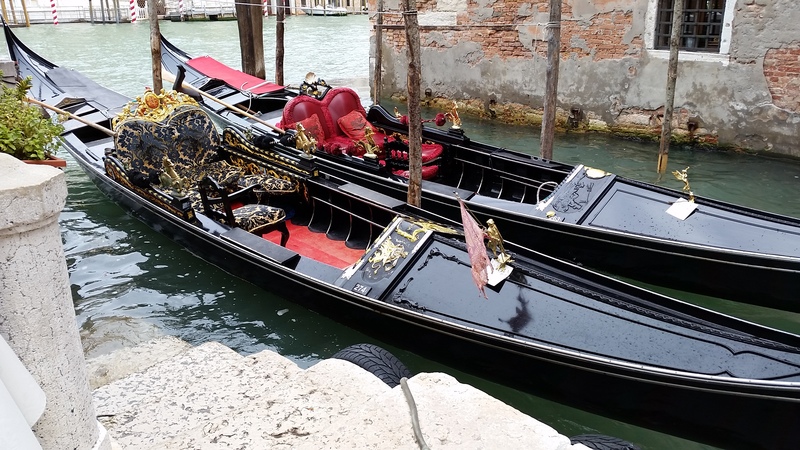 Many would like to see them banned from using the Giudecca Canal and use a different route. In November, 2014 such a ban was instituted that restricted ships over 96,000 tons from using the canal. Unfortunately Venice’s Regional Administrative Tribunal has since thrown out the limit. The Italian Transport Ministry stated it will appeal the decision to the Council of State. But I digress….. I was the first one up this morning, Richard was awake a little later and then he woke Dennie. Good thing because Emanuele arrived 15 minutes early for our Rome apartment checkout. Thankfully, Richard had realized that I made a 2 hour mistake as to when our train to Florence was. I called Emanuele yesterday afternoon and he was able to rearrange his schedule. He did a quick check through the apartment and finding nothing amiss, he returned our Security Deposit. Woo hoo.. a little extra cash to spend on the rest of the trip. It was a cloudy day and looked like rain with it being the same forecast in Florence. Our little elevator was stuck for the first time since we arrived. Richard carried his suitcase down the stairs and Emanuele carried mine. Dennie waited for us to get downstairs and send the elevator back up for him and his suitcase. We were going to walk over to the Piazza and catch a cab, but decided to just have Emanuele call a cab for us and we were on our way to Termini Train Station. We had 90 minutes before our train would leave for Florence.